EU Demands Compensation for US Steel Tariffs at WTO - Integration Through Media ....! 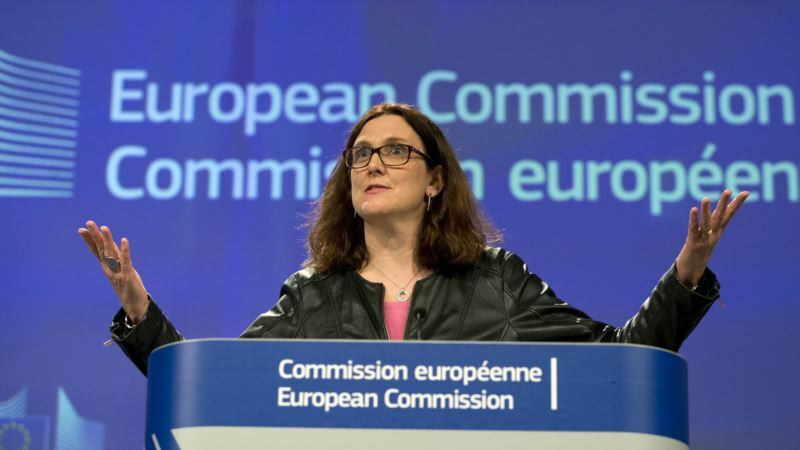 (VOA): The European Union is seeking compensation from the United States for U.S. tariffs on steel and aluminum, despite Washington's assertion that they are not subject to World Trade Organization rules, a WTO filing showed Monday. In a step already taken by China, the EU said it did not accept the "national security" justification for the U.S. tariffs but said they had been imposed just to protect U.S. industry. "Notwithstanding the United States' characterization of these measures as security measures, they are in essence safeguard measures," the EU statement said. Safeguard tariffs can be imposed on imports of a particular product if a country's own industry is at risk of serious damage from a sudden surge of imports. In the U.S. case, critics of Trump's policy say there is no such threat. The EU said it wanted to hold consultations with the United States as soon as possible. U.S. President Donald Trump announced the tariffs last month, causing a global outcry because the penalties were seen as unjustified and populist. Countries can claim exemption from many international trade rules if they can show they are imposing tariffs to protect their national security. But those exemptions do not apply for safeguard sanctions. The EU and other U.S. allies are not only worried the tariffs will limit the amount of their goods getting into the United States. They also fear steel barred from the United States will flood back into their markets, causing a glut. China had said it will retaliate by putting duties on up to $3 billion of U.S. imports including fruit, nuts and wine. The EU is drawing up its own list of duties.